Vendor management is something not often thought about when putting together a Safety Management System, but taking a moment to assess the vendors your operation makes use of can identify any hazards associated with that vendor, as well as the quality of the service they are providing your organization. Recognizing any impairment a vendor may bring to your operation will save your organization a great deal of money in the future. With the Vendor Management Module you can search for a particular vendor by name or email address, filter vendors by classification, and change the number of records returned per page. You can also search for vendors by selecting the first letter of the vendor’s name, or if they are unauthorized. A vendor is a person or company that provides goods or services to another company. In SMS Pro, Vendors are also called suppliers. Vendors are treated equally, but we don't want you be become confused when we talk about Vendor Management vs. Supplier Management. SMS Pro's Vendor Management module has many purpose, but the primary purpose is to include your vendors, suppliers and contractors in your risk management program. Very often, vendors or suppliers are related to reported aviation accidents and incidents. Their employees may have been at fault, or the fuel or equipment may have played a role in the aviation incident or accident. Using SMS Pro's Vendor Management module, safety managers will be able to easily associate vendors with reported incidents and accidents. But there are many other purposes of the Vendor Management module, such as showing all managers the latest risk assessment or rating for each vendor or comparing vendors according to their category and risk rating. Having a Vendor Management module in your aviation safety management system simply makes good sense. Airports can use the vendor management module also for managing tenants. SMS Pro's Vendor Management module is an integrated, Web based collection of tools to manage vendors, suppliers, contractors and tenants. Vendor Management module is required to be able to associate reported aviation incidents and accidents to vendors. The other SMS Pro Web based safety management software module that is dependent on the Vendor Management module is "Vendor Message Acknowledgement." Why Manage Vendors in an Aviation SMS Program? Vendors, suppliers, contractors and tenants participate in the same environment as your airline or airport. They are often directly or indirectly involved with your reported aviation incidents and accidents. Having the ability to communicate easily with your vendors and to perform risk assessments on them is an invaluable tool for any modern aviation safety management system. Who Manages Vendors in Your Safety Program? 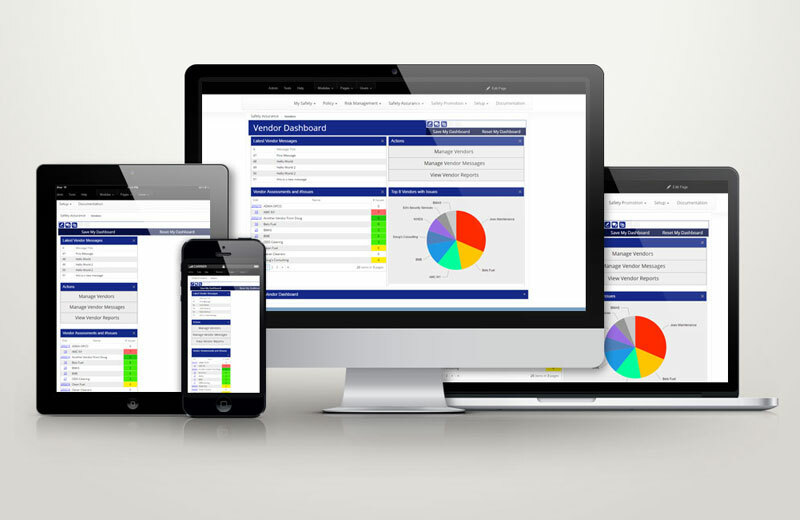 In most cases, safety managers and their assistants manage vendors in SMS Pro's Vendor Management module. The security for editing Vendors can be very granular, with the assignment of only one person assigned to editing vendors or assigning editing permissions to a particular role, such as Department Heads. How are Vendors Managed in Aviation SMS Software Programs? SMS Pro's Vendor Management module is not a module that you setup and forget, like the "All Employee Letter." This module requires an initial setup. All you need are the vendor names, addresses and point of contact information. Adding vendors to the system is very easy and can be delegated to an assistant. Contact SMS Pro support staff if this is your case. Once vendors are entered into the system, you can continue to work on the optional sections, such as classifying the vendor, assessing the vendor or relating reported aviation accidents and incidents to vendors. You may also wish to perform an evaluation on all vendors on a regular bases to minimize risk to your operations. Use the Custom Inspection Form Creator module to create your evaluation checklists. Then return to the Vendor Management module to evaluate vendors according to your standards. If you do not have any company vendor evaluation checklists, simply perform a Google search for "Vendor Evaluation Checklists" and you will find many examples. Whenever reported aviation incidents or accidents enter your Web based aviation safety management system, safety managers can associate or relate reported events or hazards as appropriate. Vendors and suppliers should be reviewed at least on an annual basis to determine risk to your operations. Being able to document, review associated issues and perform a quick risk assessment on your vendors is easily accomplished using SMS Pro's Vendor Management module. The final deliverable and value added service to your airline or airport is that the Department Managers can easily view the list of vendors and their associated risk level. This information conveniently adds weight to a manager's decision to renew or extend existing contractual relations to vendors or suppliers. When are Vendor Management Tasks Completed? Commonly, Vendor Management module is not addressed until after the first or second year of SMS implementation. There are so many other aviation SMS elements to address and vendors have never been a top priority during an SMS implementation. We recommend that Vendors are added into the system as soon as possible to allow safety managers the ability to associate reported aviation accidents and incidents to these external stakeholders. Vendor management tasks will then be carried out on a regular basis if sufficient resources are available. For example, when a safety manager has time, he may perform a vendor assessment during a safety committee meeting. Vendor assessments are very quick and easy to conduct. Vendor evaluations, using formal vendor quality checklists, requires considerably more time and is only performed when an airline or airport is adequately staffed to perform these activities. How your airline or airport manages vendors and their associated vendor evaluations and assessments should be explicitly addressed in your aviation SMS policies. A common place to manage these SMS policies is SMS Pro's Policies and Procedures module. An alternate or co-existing location for vendor management policies can be your SMS manual. More information follows regarding SMS Pro's SMS Manual Creator as well. Vendor Message Acknowledgement is another module in SMS Pro used to communicate with vendors via email and to document the receipt of their messages. More information about the Vendor Message Ackowledgement module is at the right.